Built by the married artists Claes Oldenburg and Coosje van Bruggen, Spoonbridge and Cherry is the centerpiece and most well-known instillation at the Walker Art Center’s Minneapolis Sculpture Garden. Delighting locals and visitors alike since 1988, the giant spoon with its shining red cherry is as iconic as it gets for contemporary public art pieces in the United States. Commissioned in 1985 Spoonbridge and Cherry was a gift from Frederick R. Weisman in honor of his parents, William and Mary Weisman. Oldenburg, a well respected contemporary artist rose to fame with his giant sculpture of everyday objects, but it was his wife van Bruggen who thought to add a cherry resting on the spoon. Oldenburg’s original idea for the giant spoon started because he had a strange habit of drawing spoons to occupy his mind while he was trying to think of other things. Minneapolis has over the years fallen in love with the sculpture and after Spoonbridge and Cherry was vandalized in 2012 as part of a “Kony 2012” protest the city lost its collective mind. The artwork was promptly cleaned and became even more of a symbol of the city than it had been before. Spoonbridge and Cherry is not just a static sculpture since the stem of the cherry is a fountain. The cherry stem seems to spray water into the spoon which then falls into the pond below, but actually works a little differently. The water from the cherry stem mostly turns to mist and there is water flowing from below needed to fill the spoon. 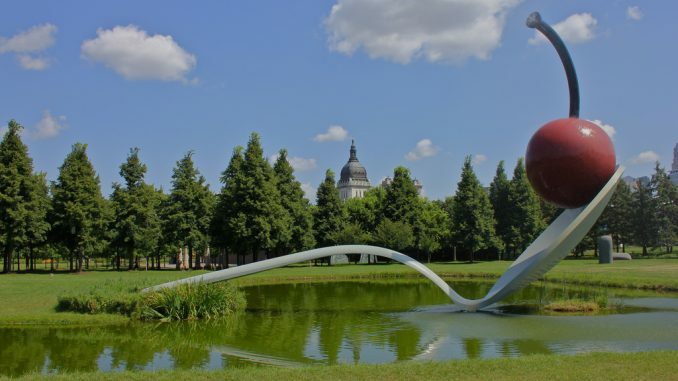 Walker Art Center’s Minneapolis Sculpture Garden is the largest urban sculpture park in the world. The spoon weighs 5,800 pounds and the cherry weighs 1,200 pounds. Spoonbridge and Cherry was installed May 9, 1988 and officially inaugurated just two days later on May 11. The pond below the sculpture is shaped like a linden seed to help draw attention to the rows of linden trees planted nearby. The Minneapolis Sculpture Garden at The Walker Art Center was designed by the architect Edward Larrabee Barnes. The sculpture is made of stainless steel and aluminum painted with polyurethane enamel. The dimensions are 29 ft. 6 in. x 51 ft. 6 in. x 13 ft. 6 in. (9 x 15.7 x 4.1 m).